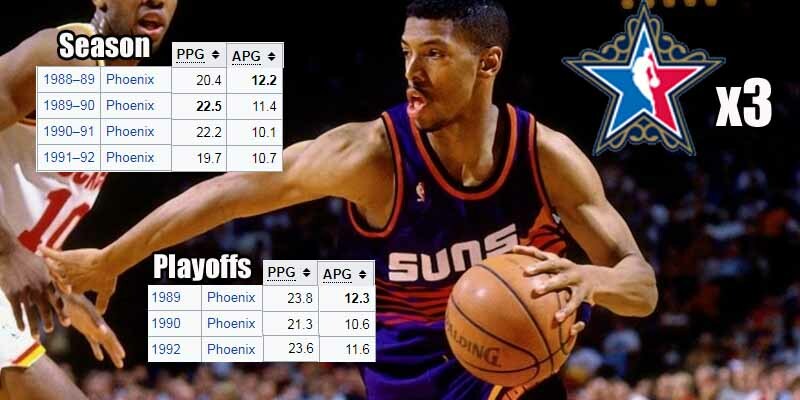 The highest point of Kevin Johnson‘s career was an NBA Finals appearance with Charles Barkley and the Phoenix Suns in 1993. What’s often forgotten is that he made some great things happen for the team even before the Round Mound of Rebound showed up. He lead Phoenix to two back-to-back WCF appearances in 1989 and 1990, schooling a prime Magic Johnson along the way during the latter and averaging 20+ points and 10+ assists at 22 and 23 years old. He’s also one of only 3 players (Isiah Thomas and Oscar Robertson) to average 20+ points and 10+ assists in three consecutive seasons and one of 3 players (Isiah and Magic) to average 20 and 12 for a season. All those things make KJ arguably the most underrated point guard of all time.